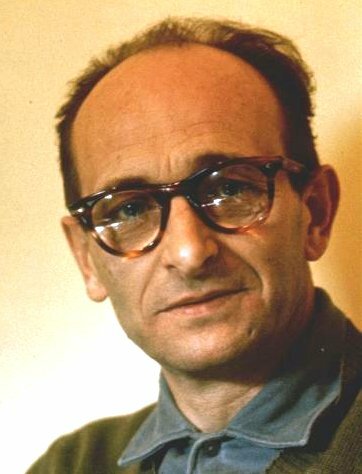 Adolf Eichmann joined the Austrian Nazi party in 1932 and later became a member of the SS. When Hitler came to power in January 1933, Eichmann returned to Germany and joined the German SS full time. Since then he rose quickly through the ranks and enjoyed a successful career. Due to his organizational talents and ideological reliability, he was tasked by the party to manage the logistics of deportation of Jews to ghettos and extermination camps by trains in Nazi-occupied Europe until the end of the war. At the end of the war, Eichmann was arrested and interned in an American camp, but he managed to escape to Argentina. In 1960, Israeli secret agents Mossad * abducted him and took him to Jerusalem where he stood trial. Eichmann was sentenced to death and executed in Ramleh Prison on May 31, 1962 for crimes against humanity and the Jewish People. Political philosopher and writer Hannah Arendt (1906-1975), reported on this trial for the New Yorker Magazine. At the trial, Eichmann defended his actions by saying that he was just following law and order. Even as he listened to the evidences against him, he seemed to see no wrong with what he had done. Arendt described him as a product of a system that had prevented him thinking critically, this man just chose not to think too hard about what he was doing. He was not brave enough to question the given rules and did not resist the thought patterns in a totalitarian state. He had been brought up to obey the law and trained to follow orders. Arendt coined the words ‘ The Banality of Evil ‘ ** to describe what she saw in Eichmann. Banal is something common, boring and unoriginal. Something not exactly evil, but equally dangerous. By failing to question what he was told to do, and by following law and order, this man took part in the Holocaust even though from his point of view he was just creating train timetables. * Eichmann’s abduction carried out by Israel was criticized and is still criticized by some to this day, as a violation of a country’s sovereign right. Yet after back-room negotiations, Argentina and Israel laid the matter to rest by issuing a joint-statement in August, 1960. ** Some critics accuse Arendt sympathized with Eichmann. And evidences – some of it known at the time, some surfaced since — indicates that Eichmann knew very much what he was doing with awareness of the evil. This photo was taken by Danish press photographer Vagn Hansen and appeared on the front cover of Danish illustrated weekly magazine Billed Bladet in November 1956. 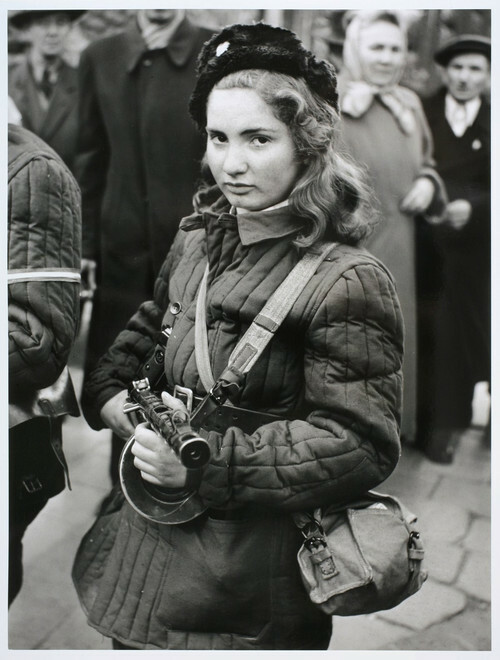 The solemn girl in the photo is an insurgent about fifteen years old, donning military uniform and holding a PPSh-41 submachine gun in her hands, became a symbol of heroism and courage of the generation. On 23rd October, 1956, Hungarian students and workers took to the streets of Budapest and issued their demands which included personal freedom, democratic election, the removal of the secret police, Soviet troops, and Communist control etc. AVH guard ( Hungarian State Security Authority) opened fire. People did not back down, a revolution was ignited. To suppress this and restore oder, former U.S.S.R deployed heavy tanks and troops into Budapest. They acted with immense brutality even killing wounded people. By 14th November the revolution was crushed. About 3,000 Hungarians were killed and another 200,000 fled the country. The liberal Hungarian prime minister Imre Nagy was tried and executed and buried in an unmarked grave. Many insurgent leaders and fighters were later identified by press photographs and were arrested, sentenced and killed by the authority. Children as young as twelve were reported fought against Russian tanks and soldiers. The girl in the photo was later identified as Erika. According to source, she saved the wounded freedom fighters as a Red Cross volunteer and died during the fights after the Soviet invasion of 4th November. I first saw this photo in a book called ” Hiroshima – The World’s Bomb ” (Author : Andrew J. Rotter, Oxford University Press, 2009.) in a bookstore. I was deeply moved – and still am – by this image to purchase this book. The photo was taken by American photographer Joe O’Donnell in September 1945 in Nagasaki, which was struck by an atomic bomb on 9th August. Back then O’Donnell was a 23-year old Marine Sergeant. He was sent by the U.S. military to document the damage inflicted on the Japanese homeland caused by air raids of fire bombs and atomic bombs. Over the next seven months starting September 1945, he traveled across Western Japan chronicling the devastation, revealing the plight of the bomb victims including the dead, the wounded, the homeless and orphaned. Images of the human suffering was etched both on his negatives and his heart. In the photo, the boy stands erect, having done his duty by bringing his dead brother to a cremation ground. Standing at attention was an obvious military influence. 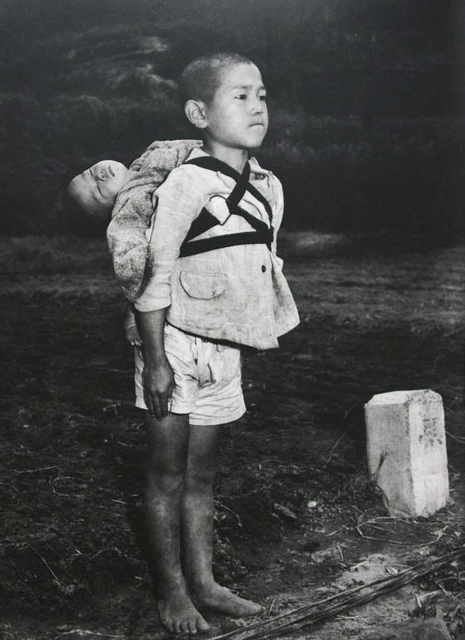 Looking at the boy who carries his younger sibling on his back, keeps a stiff upper lip, tries so hard to be brave is heart-breaking. To me, he has epitomized the spirit of a (defeated) nation. Emperor Hirohito urged his subjects to “endure the unendurable” in his surrender speech delivered through radio broadcast on 15th August, 1945. This boy was one of those who had to endure it. And if our history will be recorded one day, we will be able to say that we resisted ! we will be able to say that we resisted! I spotted this writing back in 1996 in a small museum when my band was in Germany. It was a makeshift museum to commemorate the fall of Berlin Wall. This writing struck a chord with me, immediately I took a picture of it. As there was no additional information about it, I had no idea who the writer was. It was after some years, with the help of a friend, that these words were identified as an expression by Lajos Kossuth. Kossuth was a 19th century Hungarian political leader. He led the fight – though unsuccessfully – for his nation’s independence. After the defeat by Austrian and Russian army, he became an exile and finally died in Italy. I printed out a copy of this writing, framed it and placed it on the reception desk in my working studio. To the next of this writing, there I put a small Goddess of Democracy figurine. Over these many years, whenever there are clients or friends ask me about it, I explain the background to them. When they request : “May I copy it ?”, I just say with delight : “Certainly !”. Hong Kong is not yet died as long as we still live !